Please use your green-lidded rubbish bin for all rubbish that cannot be recycled or composted. We collect green-lidded bins every other week. To find out when your collections are, find your street in our directory. Please put your bin out for collection by 7am at the kerbside with the handles facing the road. Bins should be removed from the highway as soon as possible following collection (maximum 24 hours) and returned to your property. Please note that your bins will not be collected if rubbish is compacted, bin lids can’t close or bins are too heavy to safely be collected. If your bin has not been collected you should have received a bin tag informing you of the reasons why this has happened. If your bin has not been collected and you have not received a bin tag please visit the missed bins page to report it. You can sign up for free email alerts for your street's collection via our bin collection calendar. We have an app, Your Rubbish, that you can use to remind you to put out your bins on the right day, what you can put in your bins and more! Find out more about it on our Waste and recycling app page. What can I put in my green-lidded (household waste) bin? 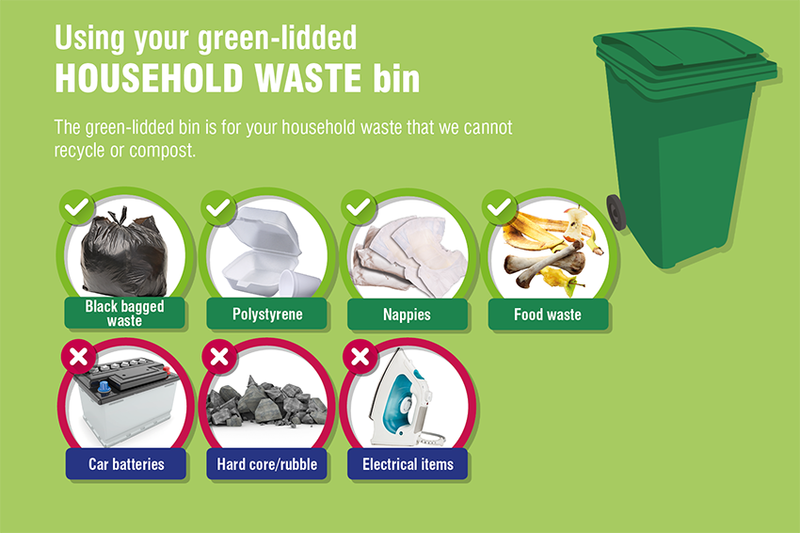 Your green-lidded bin is for all items that cannot be reused, recycled or composted. Please see the A-Z of rubbish and recycling if you are unsure of where an item should go. We are able to collect small quantities of polystyrene in your green lidded bin, we would ask where possible this is bagged. Large quantities should be disposed of at the Recycling and Reuse Centre (the tip) on London Road.